The committee on preparation of the constituent conference started its work in the beginning of 1992. It was formed by the representatives of the Humanist Party of Russia (HPR), the Voluntary Society 'OASIS', the Party of Russian Sovereignty, the Spiritual-Political Union 'Rossy'. The idea to create the International Coalition belongs to Sergey Petrovich Semenov, a well-known doctor, spiritual and public figure, the ideologist of the HPR. 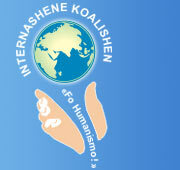 The constituent conference of the International Coalition "For Humanism!" took place in St. Petersburg on 26 December 1992. A declaration was elaborated and the organizing committee elected. Alexey Igorevich Chernetsov became the head of the organizing committee and leaded successfully the Coalition activities during four years. The next conference, the organizing one, took place on 28 February 1993. The representatives of various public and political organizations, scientists, art workers, deputies, the citizens of more than 20 cities of post-Soviet space collaborated in it.On 29-30 May 1993 another conference entitled "The Culture as the System of Mental Production", took place. As a result of the conference work an appeal to public figures, politicians, scientists and art workers was worked out. Further followed annual conferences 1994, 1995, 1996, 1997. Here you can get acquainted with some materials of these conferences. Since 1998 the annual conferences were suspended due to objective reasons. Both representatives of organizations and individuals from various regions of post-Soviet space contribute to the activities of the Coalition. Also the delegates from Spain and Egypt took part in the conferences.